Still looking for a great way to celebrate Independence Day? 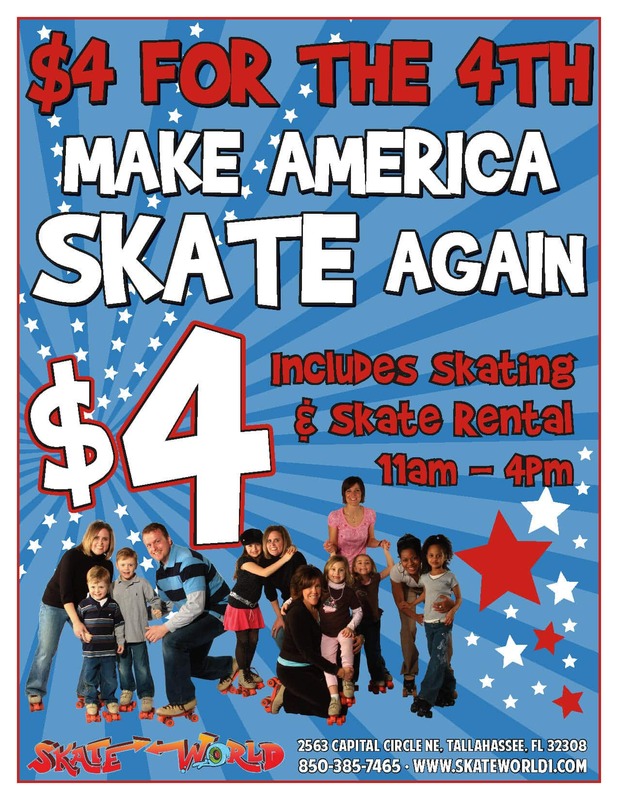 Skate World in Tallahassee, FL has the solution: join us as we Make America Skate Again! On Tuesday, July 4th, from 11:00 am to 4:00 pm, admission is only $4 per person, including skate rental. This unbeatable deal means you and the whole family can escape indoors during the hottest part of the day, then enjoy fireworks when it cools down in the evening. For an additional fee you can also enjoy our indoor play area, catch some of the awesome games in our arcade,and have some delicious treats at our snack bar. Don’t forget, your admission includes unlimited skating during the day! Do you want to brush up on your technique before you join us for the 4th of July, or are you a newbie in the world of roller skating? Not to worry–Skate World also offers skating lessons for every level, from total beginners to advanced skaters. We even teach speed skating. Beginner lessons are only $9, including skate rental, and take place every Saturday morning, so you have plenty of time to practice your new skills and really impress your friends and family on Independence Day. Skate World in Tallahassee, FL is dedicated to bringing you the best in family fun anywhere around, at prices that can’t be beat. Our summer hours adjust to keep up with your school schedules, and we always have new events planned! Don’t forget to follow us on Facebook for the most up-to-date information.